Download this page's Baptism Policy as a PDF document. 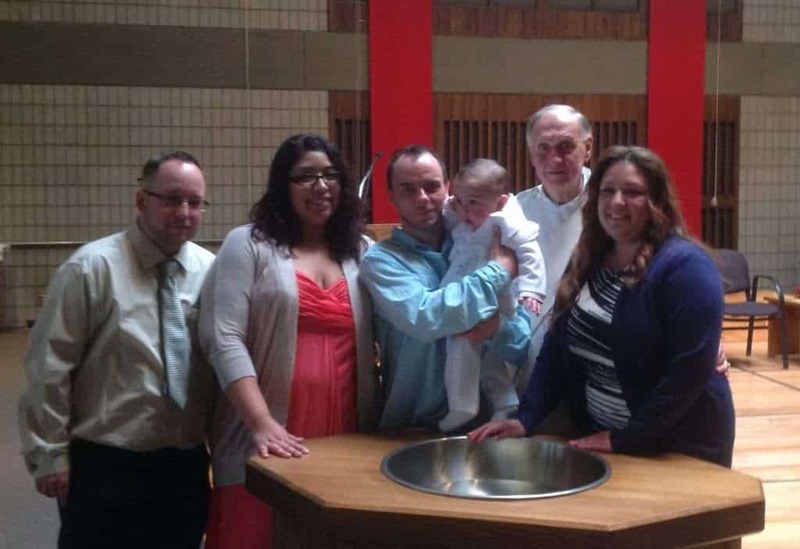 The Church of St. Matthew Catholic Community welcomes a child and his or her parents for the Sacrament of Baptism. We invite you to be a living part of our faith community. If you have a child you would like baptized, follow the instructions below, complete the baptism registration form and submit it to the St. Matthew parish office. The baptism class at Our Lady of Guadalupe requires registration a week in advance, so call 651-224-9793 and talk to Linda Rivera Monday-Friday between 9 and 1 to register. After those steps are completed, then we will schedule your family for baptism, which is held during Mass on the first weekend of the month. If you have children making First Communion in the next year or two who have not been baptized, it is important to begin taking steps now for their baptism. When Jesus was baptized by John the Baptist, his baptism was with and for a community of people. The voice from heaven, “This is my beloved son, with whom I am well pleased” (Mt 3:17) was heard by Jesus, John, and the people who gathered on the banks of the Jordon River waiting for their own baptisms. living life in a relationship with God and people who believe in God. expressed daily in our relationships with others. always changing and developing as we grow older through our everyday experiences. required for the Sacrament of Baptism and all the Sacraments of our Catholic Church. planting the seed of faith in your child. beginning a life-long relationship between God (who the parents represents) and your child. making a public commitment to nurture your child’s new faith with the help of a believing community. Register in the parish if you are not already a member or provide a letter from your pastor giving permission for the baptism to take place at the Church of St. Matthew. Complete a Baptism Class Registration Form and include a copy of your child’s birth certificate. Mail or drop off the information sheet and a copy of the birth certificate at the Parish Center. Attend a Baptismal Preparation Class in the Church of St. Matthew held the first Saturday of the month from 9:30 am until 11:00 am in English. A Spanish class is available upon request. Parents and sponsor (godparent) must attend. Register for the class by calling Linda Rivera at 651-224-9793. After the paperwork and the class are completed, a date and Mass time for the baptism can be scheduled. Baptisms at the Church of St. Matthew are celebrated at either the 4pm Saturday Mass or the 10am Sunday Mass on the first weekend of each month. Two baptisms per Mass are scheduled on a first come first serve basis. Arrive at least 20 minutes before the Mass at which your child is scheduled to be baptized. Parents can choose one or two sponsors. A sponsor must be a practicing Catholic at least 16 years of age who has received the Sacrament of Baptism, First Communion, and Confirmation, is in full communion with the Church, and lives a life of faith. If two sponsors are selected it is preferred that one be male and the other female. A non-Catholic baptized Christian may serve as a witness but only if a Catholic who meets the requirements in #1 has been designated as a sponsor. Sponsors and witnesses serve as role models for a baptized child and assist the parents in the faith formation of their child. A sponsor and witness should be chosen carefully.